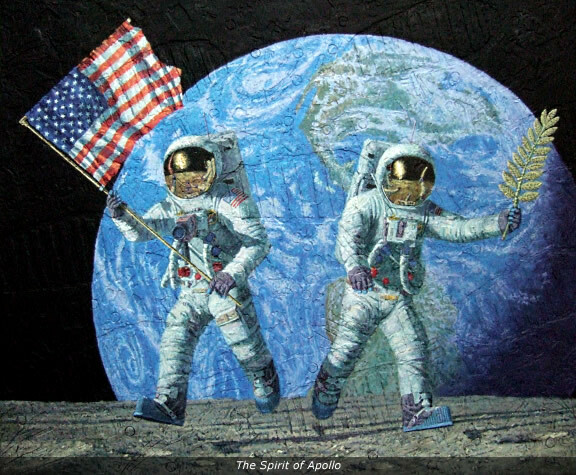 Completed 2010, textured acrylic with moondust on aircraft plywood, 41 1/4" x 50"
When I resigned from NASA in June 1981, I planned to create a painting that I thought would symbolize the spirit of Apollo: How we felt after laboring together to find a way to travel 240,000 miles to the moon, walk on it, and return safely to earth. I wanted the painting to show what it meant to all of us. I thought of a lot of ideas over the 29 years since 1981 but none seemed right. I could say how we felt in words, but I could not find the right way to show it visually in a painting. I had come to believe that the most priceless legacy of Apollo was not the great amount of scientific data we brought back to earth, but the special spirit that enlivened our whole nation, indeed much of the world, that we humans could do much more than we ever imagined, and for the right reasons as well. I was talking about this unrealized painting with my friend, Professor Ulrich Lotzmann, who was visiting from Germany. He is a man of great energy and imagination and an accomplished artist in his own right. We talked at length, but without much success. Professor Lotzmann said that on his return to Germany he would think on the problem, and send me some drawings by e-mail. Well, he did, but they didn't seem to me to be on target for one reason or another. Professor Lotzmann read my feedback e-mails, came up with new and better drawings, and most importantly, did not give up. Over a six-month period, drawing after drawing arrived in my inbox, maybe sixty or more. Then one day a drawing that looked like it might tell the story showed up. I quickly set about painting a study to see if it would work as a painting. It did not, but it might with the right changes. Back and forth we went on our computers, maybe ten or fifteen iterations, and we came up with what you see now. Neil Armstrong is carrying the American flag, the symbol of our great and proud country, whose citizens had the outstanding intelligence, the amazing skills, the total dedication, and the will to take the risks to achieve the impossible dream that was Apollo. Buzz Aldrin is holding a gold olive branch. I have used my artist's license to paint the olive branch much larger than the small gold olive branch pin Buzz left on the moon, to emphasize that we came in peace for all mankind. I have used my artist's license again to paint the earth, where this incredible journey began, much larger than it actually appeared from the Sea of Tranquility. Oh, one other thing. Professor Lotzmann sent me a small piece of foil that covered the outside of the Apollo 11 Command Module. If you look closely you can see where I added it to the golden olive branch in Buzz's hand. The other foil visible in the painting was from the hatch of our Apollo 12 Command Module.